The foreclosure situation in the Chicagoland area continues to be shaky. While January marked a noticeable improvement over December, the latest Chicago foreclosure statistics show that things didn't fare so well in February. According to information that has been published by the Illinois Foreclosure Listing Service at ILFLS.com, the total number of foreclosures in Kane, DuPage, Kendall, Lake, McHenry and Will counties was higher in February than it was in January. As a result, the downward trend that appeared between December and January seems to have been stopped in its tracks. The foreclosure situation in the Chicagoland area continues to be shaky. While January marked a noticeable improvement over December, the latest Chicago foreclosure statistics show that things didn't fare so well in February. According to information that has been published by the Illinois Foreclosure Listing Service at ILFLS.com, the total number of foreclosures in Kane, DuPage, Kendall, Lake, McHenry and Will counties was higher in February than it was in January. As a result, the downward trend that appeared between December and January seems to have been stopped in its tracks. For more in-depth information about the latest statistics, check out the following information. Before delving into specific information about each county, it's smart to consider the big picture. In the seven counties for which statistics have been published, the total number of Chicago foreclosures increased between January and February. In January, the total number of foreclosures across all seven counties was 5,138. In February, the total stood at 6,168. That represents an increase of approximately 20 percent, which indicates that the real estate market in the Chicagoland area is not quite on the rebound at this point. McHenry County - McHenry County experienced the smallest increase in foreclosures between January and February in the Chicagoland area. The total number of foreclosures increased by a total of 15. There were 243 foreclosures in January and 258 foreclosures in February, which represents an increase of 5.8 percent. DuPage County - According to the latest Chicago foreclosure statistics from ILFLS.com, the total number of foreclosures in DuPage County increased by about 9.2 percent from January to February. In January, there were 448 foreclosures in DuPage County. In February, the total rose to 492. Therefore, there were 45 more foreclosures in that county in February than there were in January. Will County - The total number of foreclosures in Will County increased by 10.4 percent between January, when there were 482 foreclosures, and February, when there were 538 foreclosures. Kendall County - Kendall County foreclosures rose by 11 percent between January and February. There were 114 foreclosures in that county in January and 128 foreclosures in February. Cook County - Cook County had 3,139 foreclosures in January and 3,815 foreclosures in February, which represents an increase of about 21.5 percent. 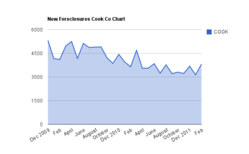 There were 676 more foreclosures in Cook County in February than there were in January. Kane County - Kane County had the second-largest increase in the number of foreclosures. The total rose from 299 in January to 390 in February, which equals 91 additional foreclosures for a total increase of 24 percent. Lake County - The largest increase in foreclosures in the Chicagoland area between January and February happened in Lake County, which experienced an increase of 24.4 percent. The total rose from 413 in January to 546 in February. New statistics and information about Chicago bank owned properties and foreclosures are published regularly by the Illinois Foreclosure Listing Service at ILFLS.com.